Hello, everyone! Fictional war correspondent Ruth Brown here. 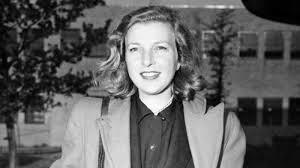 Today I'm interviewing Martha Gellhorn-novelist, travel writer and war correspondent. Born in St. Louis, Missouri, Martha is a real globe trotter. I'd like to introduce you to her. Ruth: Thanks for joining me, Martha. You are one busy lady. How did you get your start in journalism? 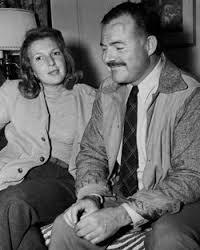 Martha: After my high school graduation from John Burroughs School, I enrolled in Bryn Mawr College. I always wanted to be a writer, and decided to leave college before graduating to pursue a career as a journalist. I was able to get some of my articles published in The New Republic which gave me some great visibility. That led to other assignments. Ruth: You make it sound easy! Martha: I think I was in the right place at the right time. After a couple of years, I decided I wanted to be a foreign correspondent. It took me a while, but I was able to get on board with United Press in Paris. Ruth: How exciting! You wrote a couple of books, too. Tell me about them. Martha: The first one was published in 1934 and is called What Made Pursuit. It's about the time I was involved in the pacifist movement in Europe. In 1940 I published A Stricken Field about Hitler's rise to power and my time in Czechoslovakia. But war reporting is my first love. Ruth: You've seen a lot of action, and not always with permission. Martha: (laughing) Yes, ma'am. As a woman war correspondent, it's tough to get to where the real war is happening. Sometimes I have to take things into my own hands. 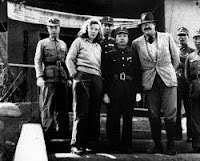 I tried to get press credentials for the Normandy landings, but no one would give them to me, so I hid in a hospital ship bathroom and then when we landed I pretended to be a stretcher bearer. I had to get there. It was terrible time, but I knew I had to experience it myself and report on it. Ruth: You're very brave. Thanks for taking time to meet with me. Good luck, and stay out of trouble! Martha: Not likely to happen, but thanks for the sentiment!